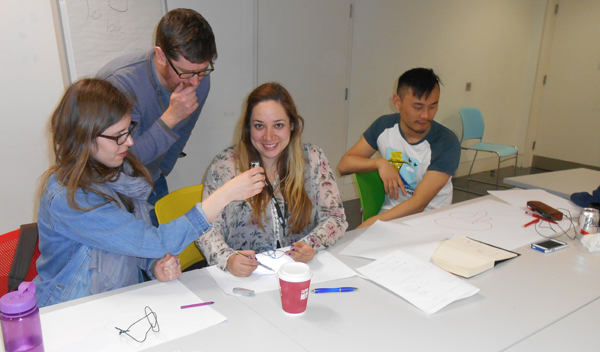 Today was the last day of our workshop series Strange Spaces, the third and final in our geometry sequence. Over the course of these sessions we’ve looked at topology, non-Euclidean geometry and higher dimensions; we finished with the unassumingly low-dimensional, hands-on subject of knots.The practice of tying knots is extremely ancient but their status as mathematical objects dates back only to the nineteenth century. 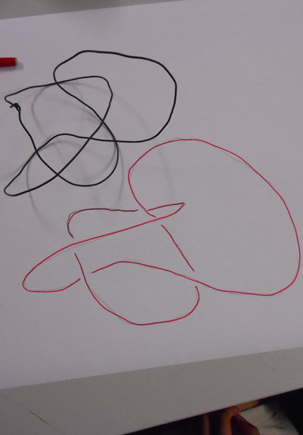 A major stimulus for research was Lord Kelvin’s theory that atoms were knots in the aether; this of course turned out to be false, but since then knot theory has in fact found many applications in physics.Each of our students made a knot using sturdy gardening wire, then (using a torch and some teamwork) drew its projection on paper. They then followed a remarkable algorithm to construct, out of paper, a surface whose boundary is the knot they originally started with. The fact that this so-called Seifert Surface always exists and can be constructed in ordinary three-dimensional space is an astonishing fact. It was originally proved in the 1930s but this concrete construction, once you agree it works for any “tame” knot, is just as good a proof. We finished with some quick thoughts about knots as paths in space, braids and links and finally the idea that higher-dimensional manifolds can be knotted in codimension 2; such exotica were a bit beyond what we could get into in class but we hope they might stimulate some further investigations. CSM students who have access to the Fine Art Maths Centre’s Moodle site can download all the slides from the course here.